Lillian Hellman’s once-controversial play The Children’s Hour gets a big West End revival – but has it stood the test of time? Soon to arrive in the West End is a starry revival of Lillian Hellman’s play The Children’s Hour, directed by Ian Rickson, and starring Keira Knightley (yes, her) and Elisabeth Moss (aka Peggy from Mad Men). The Children’s Hour has an interesting history. Hellman reputedly based it on an 1810 Scottish court case where two women running a private girls’ school were accused by a student of having an affair. The pupil’s grandmother encouraged parents to remove their children from the school, and the teachers lost their livelihood. After an arduous few years through the courts, the teachers cleared their names, but were left financially ruined and social outcasts. Hellman updated the setting to the 1930s, and added an intriguing twist to the tale, imagining what would happen if one of the women accused of lesbianism actually ‘fessed up to being a dirty dyke after all. The play opened on Broadway in 1934, and played successfully for two years, giving Hellman her first major hit, despite the then-controversial references to lesbianism, which in those days amounted to “obscenity”. It seems that the play was considered too obscene in London, where the Lord Chamberlain refused to grant it a licence to be staged. But on and on it played. The themes of a child’s lies invoking public gossip foreshadowed Arthur Miller’s The Crucible, in which “the little children are jangling the keys of the kingdom”. William Wyler produced a heavily censored film version of the play in 1936, playing down the lesbianism and reconfiguring the story as a heterosexual love triangle between the two women and one of their fiances. Wyler then directed a revised film version in 1962, starring Shirley Maclaine and Audrey Hepburn, and leaving lesbian theme intact. The Wyler version is now something of a cult classic, acknowledged as a groundbreaking film in the on-screen presentation of homosexuality . The film came in for a kicking by Vito Russo in his study of homophobia in Hollywood. Russo identifies The Children’s Hour as one of a series of mid-century films that conformed to Hollywood’s homophobic code of, as he called it, “The Dyke Must Die”, in which all female sexual deviants must pay for their crimes by being miserable and suicidal – no doubt as a warning to other wannabe bad girls to stay on the straight and narrow. 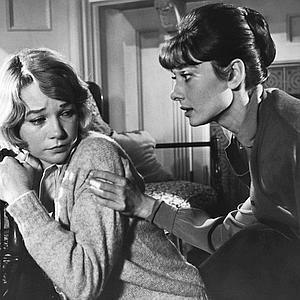 Russo’s analysis relies heavily on an interview with Shirley Maclaine, who reveals that she and Hepburn discussed the lesbian subtext with Wyler, and decided that it should be played openly. This certainly seems to have been borne out in Maclaine’s performance as Martha, the teacher who finally admits to her friend that she’s a dirty old lezzer, who really lets it rip in her final scene, with an overripe but very deeply felt portrayal of tortured self-loathing. In the film version of The Celluloid Closet, made some 20 years after Russo’s book was published, The Children’s Hour appears again, this time with a new interview with Shirley Maclaine, in which she gives a different account of the rehearsal process. It’s intriguing that no one picked up on the disparity, or questioned Maclaine about why she changed her story. I’m more inclined to believe her version in the book interview, which was closer in time to the making of the film. Though we’ll never know for sure, it seems likely that Maclaine, no doubt keen to wave the rainbow flag and show her support for gay rights, told a tale of anti-gay prejudice that she knew would appeal to the “triumph over prejudice” narrative the filmmakers wished to tell. As valiantly as Maclaine argues for the “wrongness” of The Children’s Hour and contends that a more truthful version of the story would involve Martha embracing her lesbian identity, this doesn’t quite ring true. It’s unlikely that a character in Martha’s would fight for her “budding preference”. Depressing though it is, it’s far more likely that she would loathe herself for her “unnatural” attraction to her female friend, and consider ending it all. It feels far more truthful to the experience of being gay to recognise the truth of our suffering and exclusion, rather than sandpaper it away and replace it with an upbeat story of survival and resistance. Bright acknowledges what is, in the somewhat strident, placard-waving atmosphere of gay rights culture, a much more difficult message: that many gay and lesbian people have internalised loathing of their sexuality, sometimes wish that they weren’t gay, and consider ending their lives. She also reminds us that these feelings continue even when we’re living in an age of comparative tolerance and enlightenment. Though Hollywood has certainly had a part in fostering ignorance and prejudice about gay and lesbian people, Bright reminds us that our biggest enemies are often ourselves. Perhaps our drive to deny Martha’s grim fate in The Children’s Hour says more about our need to hide our residual feelings of shame about our sexuality. Martha might be a cautionary tale, but more disturbingly, she might also be a mirror. Fortunately, we now are in a more enlightened age, and depressing stories like The Children’s Hour with self loathing homos meeting grisly fates in the final reel are no longer the only narratives being told. But The Children’s Hour still feels like a perspective worth preserving. Let’s not try to be Shirley Maclaine and wallpaper all over a past generation’s way of handling our history, and try to see past prejudices for what they are. I also can’t wait to see what Elizabeth Moss, who’s so compelling as the deeply repressed Peggy in Mad Men, does with the role of Martha.